Oh my gosh how did the end of July get her so fast.. I hope you've had a great summer. We took a trip to Montana to visit my daughter. This is the image called Wee caterpillar.. 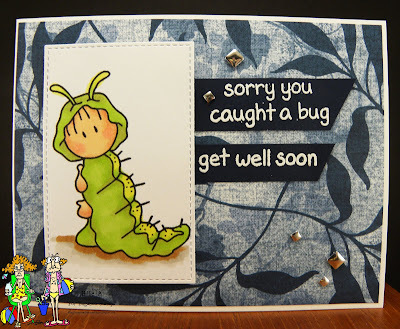 I saw this fun image and thought perfect for a get well card. I used Lawn fawn sentiment and heat embossed. I colored the image with copics and used My favorite things stitch die. I added some metal looking bling. I thought the blue leaf designer paper was perfect for the bug. I know this would make me feel better if I got this get well card. That image is sooo cute and I love your coloring! Thanks for showing us your project this week at UYS and I hope we'll see you for our next challenge! Such a cute image. Thank you for joining us at Crafting From the Heart.